As a homeowner, you have many options to upgrade your stairway system. If you’re looking to make a big change, or just need a little something different, there are tweaks you can make. Check out All Flortec’s 4 ways to make your stairs stand out. The current trend in color schemes for stairways has moved very dark. 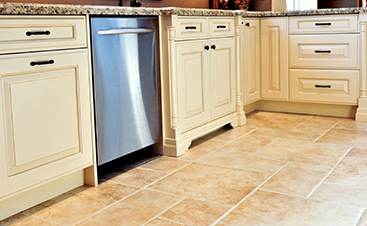 Rather than a subtle shift, this was a quick change initiated by cabinet and flooring companies. They have moved towards mochas and chocolates, both in wood species and stains. This bold new look can be a great way to make your stairs stand out! If you’re considering all-new stairs, think about darker woods that might accent your home. This goes for the steps themselves but can include the balusters, newels, or handrails as well. Balusters are the rods that run between the railing and floor to support the rail. A typical stairway has a simple wooden rod, sometimes with curved accents, and go mostly unnoticed. Why not try something a little different to give your stairway a little pop? 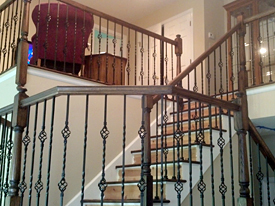 Iron balusters have become much more affordable in recent years, leading to a surge in their popularity. If you’re considering iron balusters, look at a broad selection of possible designs, colors, and shapes. They can be used to give an old rustic look to your home, or a more modern industrial look. Who said that all balusters have to be round? It’s amazing what a simple square baluster can do to make your stairs stand out. Whether you’re sticking with traditional wood or looking at iron, take a good look at some square options. A newel is a post at the bottom of your stairs where the handrail ends. In many homes, they have a simple rounded knob on top for both decoration and holding on to. However, there are some interesting trends currently that are making for enhanced newels. Many new homes are opting for a boxed newel, rather than a rounded one found in many homes. You can also customize your newel with carvings like floral patterns, your last name initial, or other designs. Some homeowners are also opting for specific wood for their newel, such as matching their flooring or wood from somewhere special like a family tree or old barn. These last two options are non-traditional, modern upgrades that can really make your stair noticed. 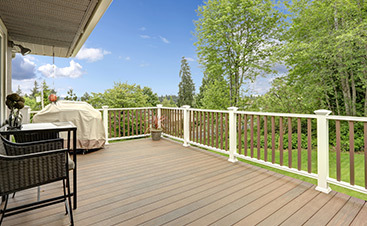 Both upgrades involve a different approach to the balusters’ territory. Rather than just enhancing the balusters, they eliminate them altogether! Linear metal panels are pre-built sections of metal handrails that mount directly to the stairs. Rather than vertical balusters, they feature horizontal metal rods that run parallel with the stair incline. A handrail is then mounted on top of these panels. This look is more common in commercial applications like museums and office buildings, but it’s making its way into the home recently. Metal tubes about 3-6” long anchor into a baluster on one stair, and metal cables run through it to the next baluster several steps away. It really opens up the visibility of the stairway and gives a very clean look. If you’re considering one of these ways to make your stairs stand out, let All Flortec help you get the look you want. 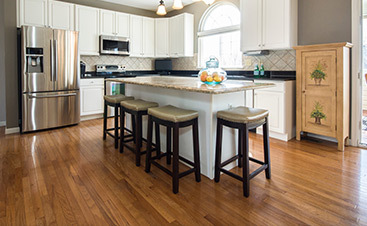 We can help you choose the best materials and designs to achieve your goal for your home. We serve most of New Jersey as well as Orange and Rockland Counties in New York. Contact us right away and let’s get started!